I've always been intrigued with the story from Harry Kellar's life where he lost all his props in a shipwreck. It's an exciting story and a tragic one and frankly a turning point for Harry Kellar. I had read the account in KELLARS WONDERS by Mike Caveney and Bill Miesel, and the story is also found in the new book THE AMAZING HARRY KELLAR GREAT AMERICAN MAGICIAN by Gail Jarrow. But upon digging, I've discovered some of the details are incorrect. 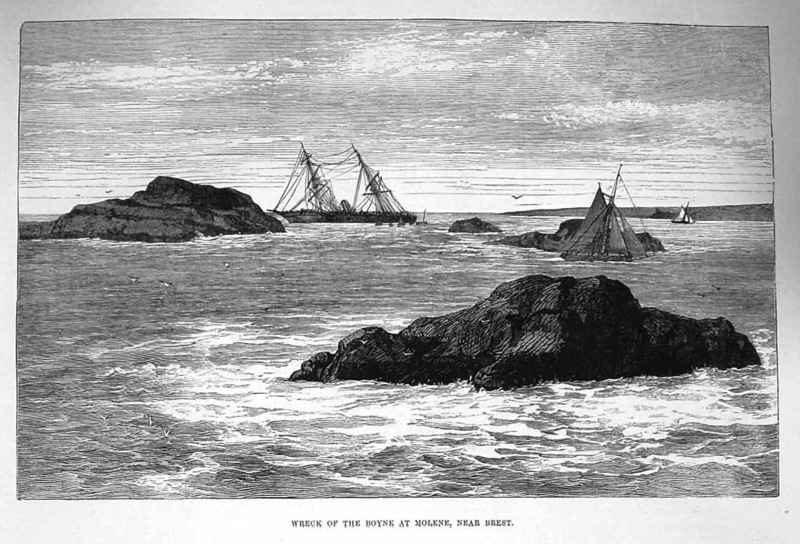 The shipwreck happened on the evening of Friday August 13th, 1875, not the 18th as listed in the KELLARS WONDERS book. According to the various magic history accounts I've read the ship hit rocks near the Island of Ushant in the Bay of Biscay. This was the region of the shipwreck, but I've discovered some more specifics which give a better idea of exactly where the ship ran ground. First however, let me share with you a little back story that leads up to the shipwreck. After leaving the employment of the Davenport Brothers, William Fay and Harry Kellar joined forces in the Spring of 1873 and began to tour the United States. Calling themselves Fay & Kellar, probably because William Fay was older than Harry and it was a case of age before beauty. Harry Kellar would do the act that he learned while working with the Fakir of Ava and then the conclusion of the show would be a recreation of The Davenport Cabinet, or what is known today as The Spirit Cabinet. The act apparently was not an immediate success as lack of money left them occasionally stranded. Their luck would change however. Kellar secured some dates for them in Cuba. At the Albisu Theatre in Havana it was said they made over $3000 during their first night on stage. Success continued for them on their tour of Cuba. From there the two went to Mexico and again met with great success. To cut down on their travel expenses they hit upon the novel idea of leaving the Spirit Cabinet behind in each city they played and simply had a new one built when they got to their next destination. Back in this time, the Spirit Cabinet was just that, a very large wooden cabinet. There was nothing faked or gimmicked about it so having the locals build a new one was easy. From Mexico they sailed on to South America and toured all over the country. The tour of South America was successful with the exception of a couple weeks in December 1874. 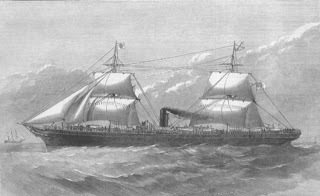 By July 1875, the South American tour was complete and Fay and Kellar got on board a steamship called the BOYNE and set sail for London. They had smooth sailing across the Atlantic Ocean and made it safely to Lisbon, Portugal. On Wednesday August 11th, the steamship Boyne set sail from Lisbon for London and there were no problems with the weather until Friday morning when a thick fog set in. At this point they plotted a course which would take them 15 miles west off the coast of Ushant Island. They checked the depth of the sea at 5pm and it was 450 ft deep. Another reading was to be taken at 7:15pm when the forward lookout alerted the captain that rocks were spotted. This information comes from a book called "The Shipwrecked Mariner" dated 1875. The book says "Captain Macauley, who was on the bridge, immediately ordered the engines to be stopped and the helm put hard aport." 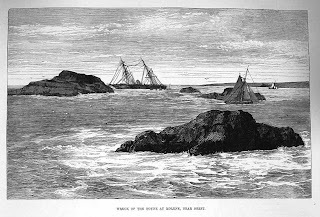 However, the ship hit the rocks right off the coast of the Island of Molene. The captain commanded that the lifeboats be lowered and safely got passengers and crew into the boats in a orderly fashion. The book says that this happened 'without confusion'. The lifeboats full with passengers and crew were taken to the Island of Molene. Once the passengers were safe on the island, the captain actually returned and stayed with his ship. The next morning, Saturday August 14th, the ships crew returned via the lifeboats to the Boyne in an effort to salvage what they could. A few bags belonging to passengers were recovered but most were lost. The Shipwrecked Mariner states that within an hour of hitting the rocks the water level was over the deck and that divers discovered the rocks completely penetrated the bottom of the ship. The Boyne was finished and so were the hopes that Fay & Kellar would be able to retrieve their show equipment and valuables. 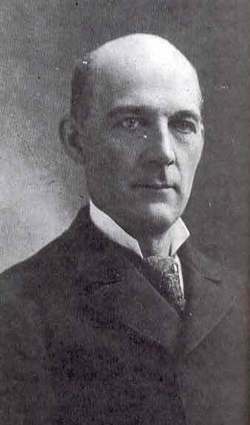 According to Harry Kellar's book A Magicians Tour "he had two chests of curios from Mexico and South America, including stuffed birds, images, a Mexican Saddle mounted with solid silver, a Mexican suit that cost $500, and specimens of the gold and silver currency of every country he had visited. He also had about $8000 worth of cut and uncut Brazilian diamonds". The estimated loss amounted to around twenty-five thousand dollars. Given that this baggage has been underwater for 137 years, I wouldn't think that the clothes or much of the curios would still be recoverable. However, gold and silver coins and diamonds, you bet! If the diamonds alone were worth $8,000 back then, they'd be worth over $100,000.00 today. It would appear (see comment by Joseph P below) that some of the gold and diamonds had been found by the crew during salvage efforts. One of the articles states the crew was helping themselves and when they were discovered, they tossed the items back into the sea. The men were arrested. Another attempt to bring up the valuables was attempted but it produced nothing. According to the article in the Otaga Daily Times, Oct 26th 1875, it was believed the treasure had either been secretly removed or sunk so deeply into the sand as to be near impossible to find. So it appears that Kellar's treasure was either pilfered by the crew or probably lost forever. Besides the Kellar books mentioned in the article, I also used 'The Shipwrecked Mariner' page 232. And a large section of this blog article was taken from a previous blog article I wrote on William Fay. Rotten luck for Kellar but might be lucky for someone else. Looked around to see if anyone has tried to recover anything, but didn't find anything. Did find in "The Annual register of world events: a review of the year, Volume 11" (1876) states under "Wreck of the Boyne" that "some of the crew broke open caskets of gold and diamonds, and were taken into custody"
Thanks Joe! I wish I had found that. It doesn't really give a definitive answer on whether or not the treasure is still there, but the fact that crew members found gold/diamonds sure sounds like they came upon Kellar's baggage. Fantastic stuff, Dean! Thank you. The only thing I can locate is that Kellar & Fay performed in Pelotas, Brazil at Teatro on Jun 15-16, 1875. I've not found any other information, yet. Thanks Aaron. I have seen several excerpts from books now on this and I'm pretty sure that the diamonds and gold belonged to Kellar. His treasure, at least that which was on board, is gone forever.